Winchester, Ind. 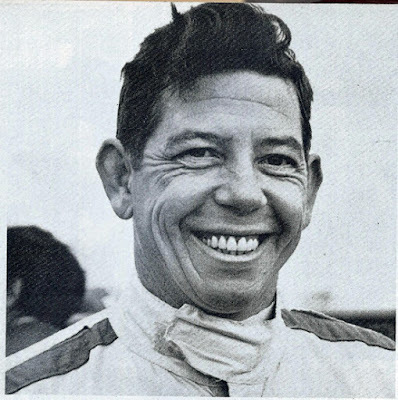 (July 28, 1968) – Pete Wales owns the world-famous Winchester high-banked, half-mile speed plant but if IMCA and Don Nordhorn show up many more times, the ownership may change hands. Nordhorn, the 34-year-old speed veteran from Wadesville, Ind., took home everything but the track from the IMCA-sanctioned and National Speedways, Inc., supervised IMCA sprint car show on Sunday afternoon for the second straight time this summer. The fastest qualifier for the day with a one-lap time of 17.73 seconds in his own #52 Chevy-powered sprinter, Nordhorn tasted defeat only once, in his 8-lap heat race before capturing the 5-lap STP handicap and then turning in a ridiculously easy triumph in the 30-lap main event. Starting on the pole, the veteran of 14 years of speed activity, coasted home by nearly one full lap ahead of Darl Harrison of Tiffin, Ohio. Harrison won a spirited three-car battle with Dave Weir in the #3 Speed Helms Chevy and Claire Lawicki in the #36 Stahl Brothers Chevrolet for second-place money and Weir grabbed show cash by a car length over Lawicki. Weir was running second and Lawicki third until they got snarled in slower traffic on lap 20 and Harrison snuck by both of them for second place. The feature was red-flagged after only three circuits when Jack O’Donnell, driving the #28 Spencer Buick, hit the turn four wall and spun approximately 140 feet down the front straightaway before stopping directly underneath the flagman’s stand. O’Donnell jumped from his sprinter and climbed the protective fence while starter Woody Brinkman brought the field to a halt. O’Donnell escaped uninjured and thee race was resumed as soon as his car was towed to the infield.